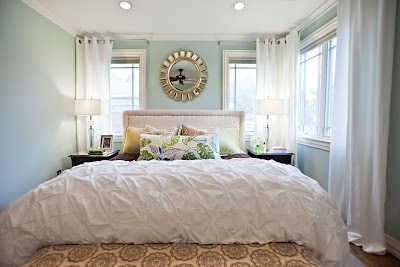 Pretty and tailored....this bedroom belongs to up and coming young Dallas designer Abbe Finemore of Studio Ten 25. She posted the before and after pix on her blog here. Abbe used what she had and recovered and repainted. The draperies dramatically change the room -- you've got to see for yourself. 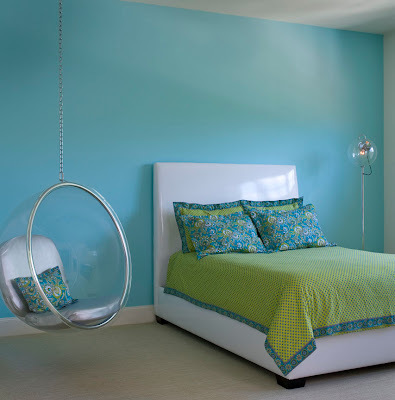 This mod bedroom was designed by Dallas interior designer Robyn Menter for a teenage girl. The Eero Aarnio bubble chair was originally designed in 1968 and I never get tired of it. I love how it looks with the bright aqua wall behind it. The fantastic floor lamp is from Artemide and the linens are by Peacock Alley. The custom bed is covered in white vinyl that looks like patent leather! I love this bedroom because it's mine. The most soothing bedrooms, to me, are monochromatic with hits of white. Blogger Samantha Reitmayer at Style Swoon was kind enough to profile my apartment on her blog last week, so check out her snapshots and the rest of her blog if you're not familiar with it yet. She's so talented! The common denominator for all these bedrooms seems to be the serene and soothing blue and green walls with crisp white. It just works.